In addition to non-fiction and history, biography is one of my favorite categories of books. At one time, I was going to attempt to read a biography of every president of the US, in order. David McCullough had just released his biography of John Adams and literary critics were praising it for being an exceptionally good read. Well, why not read about all of them. I started to make a list of books to get but hit a snag at number 8, Martin Van Buren. Not a lot is written about him. And it gets really sparse with Millard Filmore, Franklin Pierce and James Buchanan. It's still a goal but, along with floating down the Danube, it's low on the list. I believe the first biography/autobiography I read was Narrative of the Life of Frederick Douglass, An American Slave. I don't remember if I read this in high school or college. It was presented, not as a story of a life, but as a work of literature. How did Douglass deal with the theme of slavery? How does he pull the reader into his narrative and hold them? Honestly, I don't remember anything about the book other than the paperback copy I had was stoplight green with red lettering in the title. Biography is a fun place to hang out, to see all the people whose lives are fodder for books. I realized, in searching for a title for this topic, I haven't actually read much that would qualify as biography. My selection perhaps isn't so much a biography as a non-fiction discussion. My justification for including this book is that the author delves into the lives of Milton Hershey and Forrest Mars, Sr. 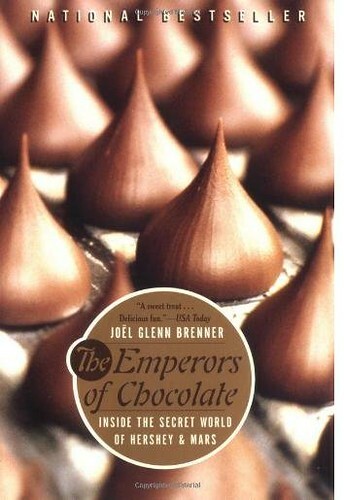 It talks about their inspirations for their chocolate, how they cornered the markets, their cut-throat advertising campaigns and the secretiveness that surrounds each company. Hershey, an orphan, created the Hershey Foundation and the town of Hershey, Pennsylvania. Orphans were and still are provided housing, food and an education by the Foundation that chocolate built. Hershey, Pennsylvania is a destination now with hotels and chocolate factory tours. For the record, I have never been there, but it's higher on the list than floating down the Danube. M&M/Mars is a privately held company whose main switchboard will tell you, if you call to ask who is the current CEO, "I'm sorry. That information is not available." Click. The determination between the two companies to beat each other up makes for fast reading. It's also rather eye-opening in how people get treated by the Mars family and, for a bit, my consumption of M&M's went down. The book also talks about chocolate, after all, these companies made their fortunes on that brown substance. There is a brief history of chocolate and a very interesting discussion on why 'synthetic' chocolate will never work. If you aren't a fan of biographies, this might be a good one to pick up as a start. It's a cultural history as much as a biography. How Hershey got the military to include chocolate bars in soldier's ration packs in World War II makes for a great read. So, this is my selection for this topic. Now I will have to run out at lunch and get some chocolate as I have none.